It’s not the way it was supposed to happen. It always arrives at the most inopportune time. It’s never invited, it just crashes your party and refuses to leave. It overpowers your thoughts, changes your plans and affects your emotions. It leaves you feeling lost and unguided. Disappointment can be annoying, crushing or somewhere in between, but when things don’t go our way, how do we really know which direction they were intended? Until that door closes, another one cannot open. Even though it’s frustrating, we have no choice but to patiently wait until the entire scenario plays itself out before we get to see how it ends. The end is usually a new beginning. A love lost that steers us toward our true partner. A career change that sparks our creativity. A move that lands us where we belong. Tears that make us appreciate every smile. Maladies that help us to celebrate life. I am always in awe of the sheer strength and determination of the human spirit. There’s something inside us that gives us an internal hug just when we need it the most. It’s like the throb you feel when a wound starts to heal. It’s your body letting you know that it’s being attended to and before long, it seems as if it had never happened. Whether you believe that you are being guided by a higher power or by the universe, we can all agree that a little fortitude, hutzpah and moxie will go a long way in reminding us that sometimes we need to go left when things don’t go right and that zag doesn’t always follow zig. Do I Need More Pippi in My Longstocking? Our only similarity is that we were both born with red hair. From the first time I met her, she was my idol. She is fiercely independent, unconventional, playful and unpredictable. Her pigtails fly in the wind, her grin widens and her freckled face flushes, as she races from one adventure to the next with her best friends: her horse, her monkey and the two children that live next door to her at her home, Villa Villekula. Pippi Longstocking (full name Pippilotta Delicatessa Windowshade Mackrelmint Longstocking) is the figment of the imagination of Swedish author Astrid Lindgren. Recuperating from an illness, Astrid’s daughter asked her mom for a story and named the main character Pippi. Initially rejected by publishers, the books have since been translated into 76 languages and made into television shows and movies. As a little girl reading the books, my eyes would widen and my heart would race; how exciting to be so free! Little did I know that my personality had already evolved, as observed by JC*. She quickly realized that, rather than inheriting her easygoing nature, my tendencies for perfection and order were thanks to my dad. She knew she had her hands full, but guided me along with such patience. By the time she received the call that I was in the nurse’s office by second period on my first day of junior high, she was resigned to the fact that I was a bit different from other children. Apparently, I did not see the humor in being handed one of the first computerized class schedules, having only a few minutes to arrive before the bell rang and being mistakenly assigned to the boy’s bathroom for second period. I visited a model home and did not rearrange anything (I’m not sure if this counts, since Mr. Wiz* was holding my hand, tightly). I polished my fingernails a completely different color than my toenails. On a whim, I changed my grocery shopping day from Friday to Thursday. I double snoozed my alarm. I impulsively ate four Triscuits with lunch, rather than my usual three and did not worry about biting cracker number four precisely on its horizontal markings. I went on a trip without any pre-planning, waking up each day and deciding on my next Wait a minute that was a friend of mine that did that, not me! Oh to be a bit eccentric! What fun it would be to make paper airplanes out of my to do lists with my avant-garde pals. Regrettably, I am only able to participate as a spectator, realizing that the only flow I am able to go with is if it has first been documented on an Excel spreadsheet. At first, I thought that living vicariously through others was unfortunate. Then I realized that family and friends are as fascinated with my quirks as I am with theirs. They loosen me up, I keep them on track and together, we walk through life one unique step at a time. When Big A* was a little boy, I told him to remember “…It’s what you hear…” If I was not there to pick him up after school, he was not to leave with anyone unless they said the word “oreja” (the Spanish word for “ear”). When he was a teen, he knew he could always whisper our code word “despacio” (Spanish for “slowly”) when he wanted me to take it down a notch in front of his friends. Throughout the years, Mr. Wiz* and I have unwittingly developed an entire communication system. Through facial expressions and eye movements, we can express ourselves in a clandestine manner, even in a crowded room. We can complement each other, ask if that’s what we’re really going to wear, agree to leave early or stay late, accept or decline an invitation on the spot or suggest that we not tell that story again. Of course, all covert operations have their glitches. Once at an auction, my sudden sneeze was misinterpreted as a signal to hold up our paddle. Luckily, we were out-bid and the Picasso never joined our art collection. Likewise, innocent tapping of fingers on a table could be misconstrued as an emergency Morse Code message. This combined with some made up words and an alpha/numeric system that my dad taught me as a little girl (whereby numbers 1 through 10 are replaced by letters) makes for techniques that rival CIA intelligence operations. Though we have been approached and asked that we share this complex, intricate methodology with operatives around the world, we have decided to keep it between us as just another way for our little family to huddle together in our private club and smile as we celebrate what makes us unique. Designer toast for breakfast anyone? -Why do we sing “Rock a Bye Baby” to infants when we know perfectly well our soothing voices will soon croon the last stanza that inevitably leads to a 911 call? -A popular new business has sprung up where you create a DIY project while enjoying cocktails. If I didn’t have any artistic ability before I entered, how will libations help my creations? -Why do airline seats recline if reclining them can lead to airplane rage (similar to road rage, but without the foot pedals and steering wheel)? -Has anyone actually been arrested for removing the tag off their mattress? If so, are they assigned to a special area of prison, along with the anglers who purchased the fish they entered in the bass fishing competition (a real thing)? -Did Dr. Seuss have anything to do with the naming of Pflugerville, Texas? Every time I pass the sign for the exit on the highway, I smile to myself and wonder: are the Pflugers in Pflugerville all filled with glee to realize their town is a source of Seuss imagery? Sometimes it’s not a bad idea to take the road less traveled, stop and smell the roses, give your mind a well-deserved rest and not be too quick to disregard the quirky. Egging Yourself on: Is it All It’s Cracked Up to Be? “…How many times around is that? …” Every Saturday, Gus, the maintenance man, would stop by and say hello, fascinated at my routine of bicycle riding around the perimeter of the giant, empty parking lot at a nearby government building. While many of my friends are cyclists and think nothing of a 50 mile day ride, I am content to be a bike rider, safely tooling around my sheltered environment. This decision comes with the confidence that I know myself well enough to understand the difference between motivation, persuasion and being sensible. If we can egg someone on, don’t we also have the ability to egg ourselves on? When should we push ourselves and when should we be prudent? When combined with spontaneity, can produce hazardous consequences. A jumbled combination of longing, jealousy, impulse and willpower (lack of). An analytical approach involving pros and cons, right and wrong, practicality and objectives resulting in a meticulously executed conclusion. Come out of your shell, get to know your inner self and together decide the path that’s right for you. Remember, a life without objectives is like an egg without salt. Who Put the Multi in Tasking? At the gym the other day, I overheard two women talking about taking some classes together and hoping that their line dance and conversational Italian language classes wouldn’t conflict. “…Too bad you couldn’t take them at the same time…,” I joked, with a mental picture of them in the throes of some intricate foot work and turns while repeating out loud “…One, two three, please, thank you, where is the bathroom? …” in Italian. “…That’s a great idea! …,” they both agreed as they exited. I tried to dress quickly, catch up with them and tell them I was kidding, but they were already gone. Picture the working mom, breastfeeding with a spoon in her teeth, as she stirs tonight’s healthy dinner simmering on the stove, listens to the news and sends one more email while her three-year-old sits at her feet, using her legs as a mountain road for his Matchbox cars. It seems as if we no longer can do one thing at a time. We squeeze all we can into each day, never considering whether each task is getting their fair share of our attention. Just like the overstimulated baby that cries out in distress, we sometimes need to be slowly rocked back into tranquility, so those big, bad to-do lists won’t huff and puff and blow us down. Focus! Try accomplishing one activity at a time and concentrate on the task. Inhale and exhale! Take a few deep breaths and remind yourself to slow down. Let go! Minimize your closet, your to-do list, your worries and keep it simple. Laugh! Seek out the silly side of life. Be quiet! Take a walk, turn off the car radio and enjoy the silence. Move it! Strive for stillness with yoga, clear your head with a run or try anything in between. Be solo! Savor some alone time, whether you are an early bird or a night owl. Back in the day, you could find me running to catch the 156 bus after a 10-hour workday. Flamenco classes were now added to my growing list of musts. Under my seat, I would practice my footwork while humming the music, eating an apple and sending just one more email. Now I can see why the seat next to me always seemed to remain empty. I admit there may have been times in the past when I had toyed with the idea of taking a computer class in a foreign language I was not at all familiar with, hoping to learn both in half the time. Nowadays, I can still task with the best of them, but I have realized that the only “multi” I should be focusing on is a multivitamin. Discovering hearts all-around her; it’s not the thread that Malia Rae intentionally set out to weave through her life, but it makes perfect sense in hindsight. A formally educated photographer, she was led on a different course than her original plan. For years, Rae called Chicago, Illinois, her home. The cold weather never ruined her sunny disposition until it intermingled with a love lost. 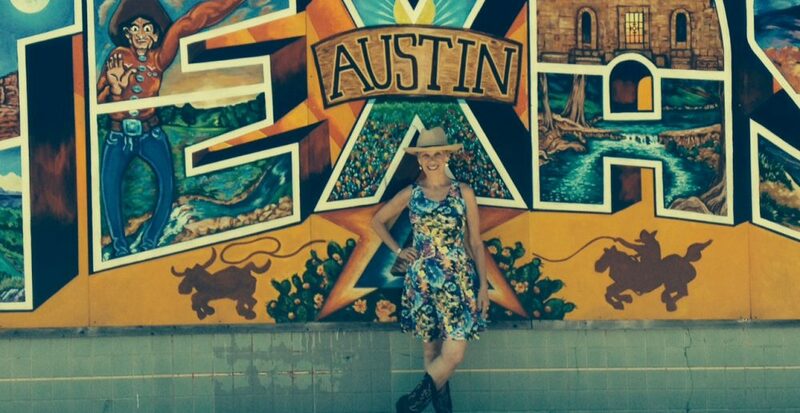 She sought refuge in Austin, Texas, when friends opened their arms to her. Perhaps her transformation could have happened in any city, but there is that vibe in Austin that seems to make it distinctive from other places; it’s so welcoming, approachable, artsy and cool (even when the temperature spikes). This weird, wonderful city seemed like a different country altogether to her and she blossomed there. This was the point where that one decision would impact her for years to come. Head held high, would she let her spirit soar, follow that inner voice, explore the unknown and start anew? Resilience won out over complacency and she buoyantly embarked on a mission to heal herself. What you look for in life, you find; Rae says she remembers the concept struck a deep cord within her and she set out on a search as if her life depended on it. Drawn to nature, she would spend hours exploring. Three months later, she was still waking at sunrise, exploring beaches and walking in the woods. Then it happened; a rock, a leaf, a cloud – all in the shape of a heart. For a moment she wondered; had they always been in plain sight or were they figments of her imagination? Luckily, her ever present companion, her camera, was there to serve as her witness. Cultivated from the depths of her soul-searching journey, it’s easy to see why her company, My SoulTribe, resonates with anyone that it touches; a tear, a smile, a sigh being the ultimate compliment. Was Mother Nature waiting for her all along? Or, did those hearts magically appear as a reminder of the power of tenderness, affection and devotion? No two are alike, yet they share the ability in making you feel as if someone is wrapping their arms around you. My SoulTribe was sprouted by two friends, Malia Rae and Liz Meitus. It began a few years ago as a quest, sparked by the concept: “What you look for in life you find.” We embarked on a mission to heal our own lives and find an inner place of peace in this chaotic world, a journey unfolding that has led us to conclude that even in the face of adversity, heartbreak and despair, we can choose Love. As we searched, it became resoundingly clear that everywhere you turn (if you have belief and an open heart) Love. Truly. Is. All around. My SoulTribe creates Art that Ignites the Soul. Join the movement… Heart Forward. ​Now, years later, I can see clearly that I have been studying Love up close and personal. Everyone sees, feels, allows, and communicates Loves in their own unique way. The caress of a hand, the wink of an eye, the side smile, and the laughter all tell a story. I’ve been lucky enough to witness, and document, the countless intimate ways in which Love shows up in this world. I am a better person for all the times my clients invite me into their lives to capture the ways in which they Love. “Soul Nature” is the evolution of this on-going adventure. Capturing the many layers of Human Nature and Mother Nature, with in-camera multiple exposures, I explore the realities between the seen and the unseen. The wisdom of the heart continues to light the way while the shadow side illuminates areas of growth and expansion.